blue-green deployments have been practiced at places like Amazon for 10+ years. They’re a safe, proven, method. Now, blue-green deployments are not a silver bullet, but there’s an element of usefulness to them. But what about A/B testing then? Or even Canary testing? With all of the #microservices, DevOps, and cloud-native talk, there’s a lot of discussion about them, but I wanted to clarify their differences. 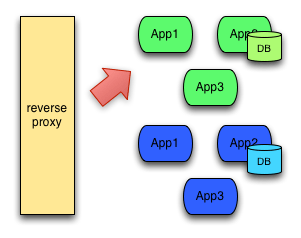 Pleaes see Martin Fowler’s link about blue-green deployments. It gives the overall gist. It’s basically a technique for releasing your application in a predictable manner with an goal of reducing any downtime associated with a release. It’s a quick way to prime your app before releasing, and also quickly roll back if you find issues. You monitor for any failures or exceptions because of the release. If everything looks good, you can eventually shut down the green environment and use it to stage any new releases. If not, you can quickly rollback to the green environment by pointing the loadbalancer back. Sounds good in theory. But there are things to watch out for. 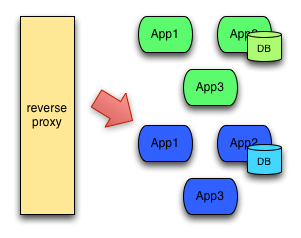 Database migrations can get really tricky and would have to be migrated/rolledback alongside the app deployments. There are good tools and techniques for doing this, but in an environment with traditional RDBMS, NoSQL, and file-system backed DBs, these things really need to be thought through ahead of time; blindly saying you’re doing Blue Green deployments doesn’t help anything – actually could hurt. As I’ve said, there are good techniques to overcome these challenges and make this deployment style work out very nicely, including plugging into a continuous deployment pipeline, but don’t jump into it trivially. A/B testing is NOT blue-green deployments. I’ve run into groups that mistake this. A/B testing is a way of testing features in your application for various reasons like usability, popularity, noticeability, etc, and how those factors influence the bottom line. It’s usually associated with UI parts of the app, but of course the backend services need to be available to do this. You can implement this with application-level switches (ie, smart logic that knows when to display certain UI controls), static switches (in the application), and also using Canary releases (as discussed below). The difference between blue-green deployments and A/B testing is A/B testing is for measuring functionality in the app. Blue-green deployments is about releasing new software safely and rolling back predictably. You can obviously combine them: use blue-green deployments to deploy new features in an app that can be used for A/B testing. Lastly, Canary releases are a way of sending out a new version of your app into production that plays the role of a “canary” to get an idea of how it will perform (integrate with other apps, CPU, memory, disk usage, etc). It’s another release strategy that can mitigate the fact that regardless of the immense level of testing you do in lower environments you will still have some bugs in production. Canary releases let you test the waters before pulling the trigger on a full release. The faster feedback you get, the faster you can fail the deployment, or proceed cautiously. For some of the same reasons as the blue-green deployments, be careful of things above to watch out for; ie, database changes can still trip you up.